Searching Trove, and presenting some of the material, even if it is just a small fraction, has become a recent habit of mine. Again, I present some new material using 40 different keywords, or combinations of keywords, that I used tonight to discover some novel hitherto unseen newspaper articles. “MELBOURNE. – If you see a “flying saucer” you’ll have to describe some sort of accompanying noise if you want your claim to be taken seriously by aeronautical scientists. Superintendent of the Commonwealth Aeronautical Research Laboratories L. P.. Coombes said that a flying object would emit some noise. A flying saucer would have to have some sort of engine, either internal, combustion, jet or turbine, and any of these would make considerable sound. But what if the engines were turned off and the plane was gliding? 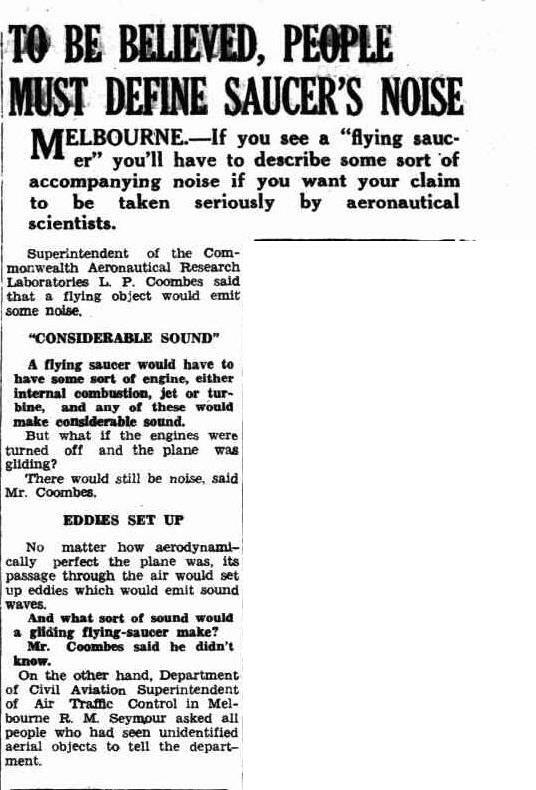 There would still be noise, said Mr. Coombes. This is a very early example of some form of official involvement, even if fleeting, from the Australian scientific community. Lawrence P. Coombes was Chief Superintendent of the Australian Aeronautical Research Laboratories (ARL) from 1938 until 1964. The ARL was, originally, under the umbrella of the Council for Scientific and Industrial Research. In 1949 the ARL was transferred to the Research and Development Branch of the Department of Supply (DOS), becoming one of the Defence Science Laboratories. Some of you may know that the DOS was involved with the UFO matter in Australia. I wonder if some of that involvement started with Chief Superintendent Lawrence P. Coombes? The article itself is imaged below. 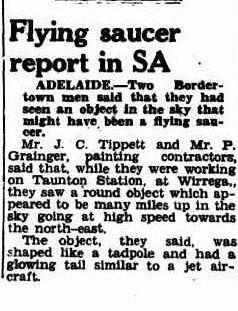 “CAIRNS — Was a flying saucer near the north on Tuesday night? This question has arisen as a result of a sight seen eastwards offshore on Tuesday night by people residing along the Esplanade in Cairns. The period of their observation extended from 10 p.m. to midnight, when the mysterious apparition suddenly disappeared. Those who saw the phenomenon report that it was similar to a huge star, surrounded by a great mist, with the star brighter by far than any others to be seen in the sky at the same time. This brilliance changed in intensity from time to time. Extending from the central light was a fan-like object on the left hand side, whilst there were two long shafts on the left. Periodically, one of these would alter its length and degree of its illumination. Throughout the period of its sighting from 10 pm to midnight, the apparition moved slowly and steadily northwards. It was seen by people whose standing and sobriety are beyond question. All descriptions of its appearance were more or less similar except for minor details. “I described what i could see to him and he confirmed that he could see a similar sight. Then whilst we were standing watching the light, a huge white mist appeared. This seemed to come at intervals and obscure the brilliance of the star, which you would not see for about three minutes. This article continues on in the same fashion for another column. It can be found using the above information for anyone who wishes to read the whole thing. This next article really stood out to me, and was printed 26th of May, 1950 in, once again, “The Evening Advocate”. 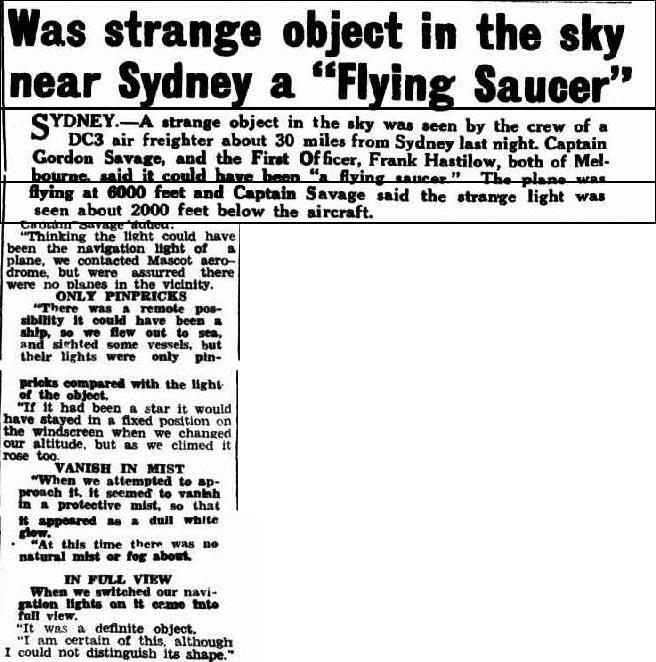 Page 1 carried the headline “Was strange object in the sky near Sydney a “Flying Saucer””. It’s not a case that’s new to us, but, this particular article is. “The time of happening was, I think, in 1902, about 3.45 o’clock in the afternoon of a summer’s day. There was not a cloud in the sky. At the time I was in charge of the school on the Queensland side at Mungindi, on the NSW border. was seen to pass across the heavens from north-east to south-west, accompanied by a rumbling noise like thunder. Quite a number of persons saw it, and the noise was heard over a distance of several hundred miles, as reports afterwards proved. Mr. A. Leslie, the then postmaster at Mungindi on the NSW side, was out with his buggv and pair of ponies line inspecting. The meteor pasted almost overhead, and his ponies stopped dead, and then bolted for several (illegible)”. The article continues on describing the event more as a meteor than anything else. Below is an image. 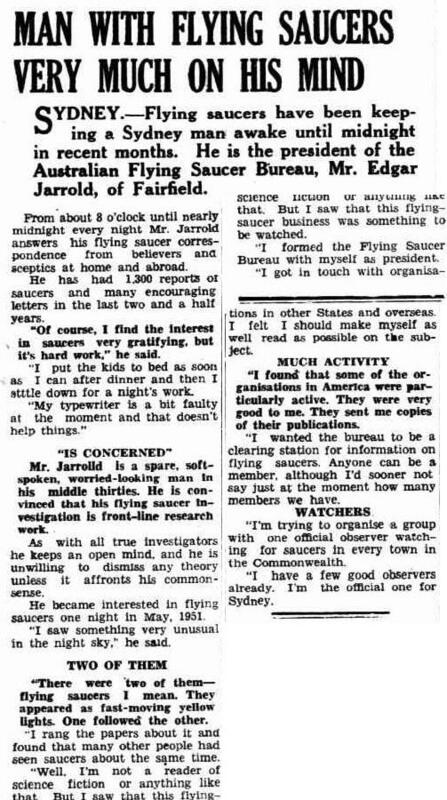 “The Evening Advocate” ran a long 12th of February, 1954 piece on Page 7 titled “MAN WITH FLYING SAUCERS VERY MUCH ON HIS MIND”. “Mr. Jarrold is a spare, soft spoken, worried-looking man in his middle thirties. He is convinced that his flying saucer investigation is front-line research work. As with all true investigators he keeps an open mind, and he is unwilling to dismiss any theory unless it affronts his commonsense. He became interested in flying saucers one night in May, 1951. “I saw something very unusual in the night sky,” he said. I have, as usual, imaged this impressive piece. “SYDNEY: Residents of Point Street. 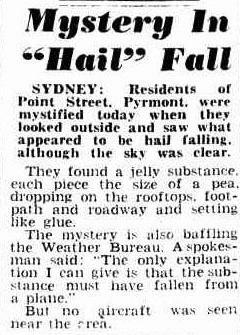 Pyrmont, were mystified today when they looked outside and saw what appeared to be hail falling, although the sky was clear. They found a jelly substance, each piece the size of a pea dropping on the rooftops, foot path and roadway and setting like glue. The mystery is also baffling the Weather Bureau. A spokesman said “The only explanation I can give is that the sub stance must have fallen from a plane”. But no aircraft was seen near the area. Again, I image the article to the right. So there you have it. These are but a few of the new articles that Trove has to offer. Dozens more stood out, but time and space permits only a sampling. Till next time. Excellent investigative and reporting work. There is a large cache of UFO reports waiting in that mass of Australian newspapers. You are to be commended for getting this into the public arena for our consideration. Great work Paul. Very interested in your results. The UFO as sea serpent in the sky is simply spectacular. Thanks for sharing yor findings. Good hunting.